This past June I made two trips to the Loess Hills of extreme northwestern Missouri as part of a follow-up survey for Cylindera celeripes (swift tiger beetle).¹ I was hoping to identify additional populations, however small, of this tiny, flightless, enigmatic species to go along with the three that colleague Chris Brown and I discovered last year. The results were good news, bad news – no new populations were found, but I was able to re-confirm the beetle’s occurrence at two of the sites where we found the beetle last year. ¹ Some of you may recall my excitement at finally finding this long-sought after species in Missouri – apparently limited to the state’s few remaining high quality loess hilltop prairie remnants. One of the sites that I had hoped might harbor the beetle is Squaw Creek National Wildlife Refuge in Holt Co. – located very near McCormack Loess Mounds Natural Area where the beetle was seen both this year and last. Squaw Creek features several thousand acres of restored wetland habitat in the Missouri River valley that serve as resting, feeding, and breeding grounds for migratory birds and other wildlife. Located within the Mississippi Flyway, the refuge is best known for its large concentrations of snow geese and bald eagles. Wetlands are not good habitat for C. celeripes, but it was not the wetlands I was interested in visiting (well, I am really interested in visiting the wetlands someday – but on these visits I had other goals). Rather, it was the tiny slivers of loess hilltop prairie that still remain on the fingers of loess bluffs along the eastern boundary of the refuge. Twice scouring these prairie remnants over a two-week period failed to reveal the presence of the beetle, but on the first visit I did see this lone, rather ragged-looking adult male Cicindela limbalis (common claybank tiger beetle). Unlike the aforementioned species, C. limbalis is rather common throughout most parts of the state on upland clay exposures. A spring-fall species, adults first emerge in September, have a little fun (which includes feeding but not mating), and then dig back into the ground for the winter before emerging once again in the spring. It is one of the first insects to greet the new season (I’ve seen them as early as late March) – mating and oviposition occur over the next month or two, and by end of May these guys are pretty well spent. An interesting feature of the populations found in extreme northern Missouri is their higher degree of elytral maculation. Compare this relatively fully-marked individual with this female that I reared from a larva collected at Knob Noster State Park in west-central Missouri (incidentally, my first ever reared tiger beetle!). This male is clearly among the last of his generation in this area – not only did I not see any other individuals on the entire trip, but he clearly exhibits signs of wear and tear. I found him nibbling on this dead millipede (which larger tiger beetles are known to prey upon); however, I don’t think this guy actually killed the millipede. Rather, I think he found it already dead and was scavenging one of the only meals still available to him. Closer examination of the face reveals that his left mandible is broken off near the base (best seen in the enlarged photo) – whether a result of battle with over-sized prey or a narrow escape from predation himself is hard to say. Regardless, with only one “tooth” his ability to capture prey on his own has been severely compromised, and about all he can do is look for already dead prey items on which he can scavenge. As one of the last survivors of his class, one can only hope that he lived a long and fruitful life, killed much prey, and inseminated many females. Photo Details: Canon 50D w/ 100mm macro lens (ISO 100, 1/250 sec, f/14-16), Canon MT-24EX flash (1/4 ratio) w/ Sto-Fen diffusers. Typical post-processing (levels, minor cropping, unsharp mask). 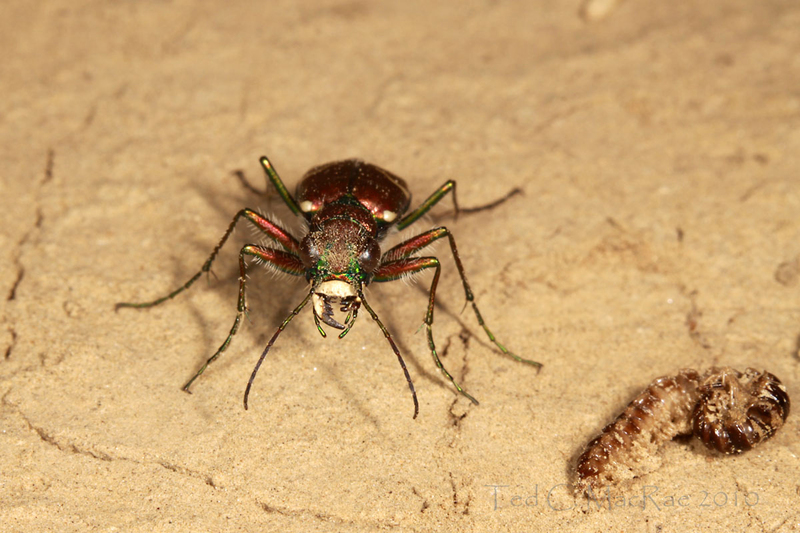 This entry was posted in Cicindelidae, Coleoptera and tagged beetles, entomology, insects, Missouri, nature, science, tiger beetles. Bookmark the permalink. That last line is poignant epitaph! This one would actually not be in too bad a shape were it not for the broken mandible – missing left front tarsal claw is the only other obvious damage I can see (perhaps lost in the same struggle that cost it its mandible). I’ve seen worse – missing legs and antennae, chunks of the wing covers broken off, normally hairy parts of the body denuded, etc. I’ll be traveling to western Nebraska, southwestern South Dakota, and eastern Wyoming over the next week or so – I should see some fresh beauties! Amazing how tiny predators are like full-sized ones. This story reminds me of a Nat Geo special about an aging lion with a broken canine, deposed by younger males. Nice parallel. I remember that story. I feel somewhat juvenile for bursting into laughter at that last line. I know a lot of people who hope the same can be said of them. Good luck in your travels! I can’t wait to see what new discoveries you bring back with you. My inner 12-yr old boy was guffawing as I wrote it! 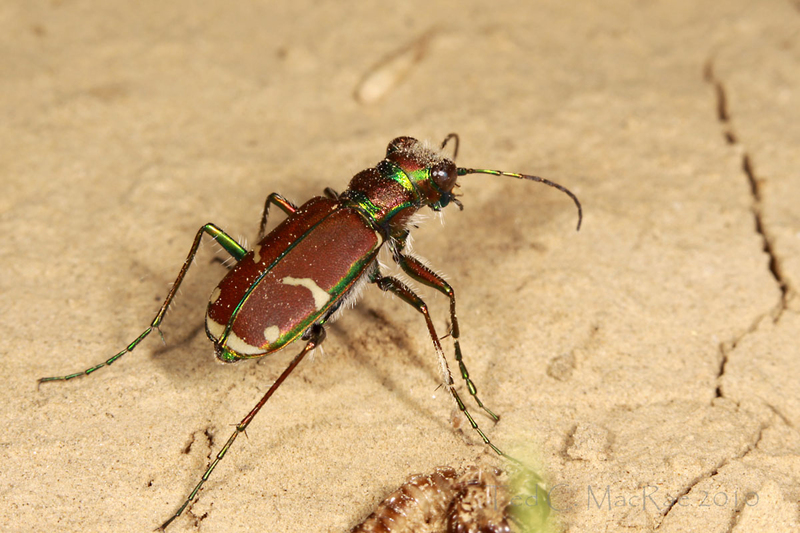 If I come back with nothing but photos of Cicindela pulchra, I’ll be a happy man.